Réedition pour la première fois en CD et Vinyle de ce classique du catalogue Strata East.Strata east est le label légendaire du jazz des Années 70.basé à New york et qui a sorti plusieurs chefs d’œuvre du jazz. John Betsch est un batteur originaire de Jacksonville en Floride et qui a notamment joué avec Tim Hardin dans les années 60 avant d’intégrer à Amherst l’université du Massachusetts (UMASS) le célèbre cours d’Archie Shepp et Max Roach. Pendant quatre ans il participe à ce collectif d’intellectuels et musiciens placés sous l’égide des deux maîtres.C’est pendant cette période qu’il retourne à Nashville former sa Society dont la musique est bien sûr fortement influencée par les concepts afro-centristes de ce mouvement universitaire et politique. Mais, enregistré en une journée et en une prise, leur album est aussi marqué par les expériences psychédéliques de leur génération et les thèmes et le jeu des musiciens laissent entendre une musique moins violente que le free jazz radical de New York ou Chicago. La nature et le thème écologique inspirent des morceaux sur lesquels planent bien sûr l’esprit de Coltrane mais aussi celui du Flower Power. John Betsch vit désormais à Paris et on peut le retrouver sur deux albums de Heavenly Sweetness : Anne Wirz et The Rongetz Society. One of the rarer records of the mythical Strata East albums is finally reissued for the first time on Heavenly Sweetness ! 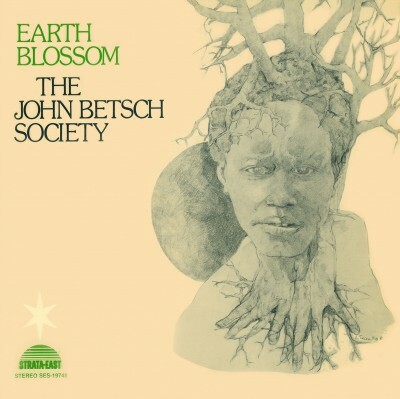 The recording of Earth Blossom, the John Betsch Societys one and only album, seems something of an enigma nowadays. For even though Nashville is clearly one of the towns in the US with the highest number of recording studios, who would have thought that the capital of country music would give birth to one of the forgotten masterpieces of 1970s spiritual jazz. The path leading to the album starts in 1963 when John Betsch, originally from Jacksonville in Florida, arrives in Nashville to study at Frisk University. He is a young drummer and joins Bob Holmes trio. Holmes is one of the towns major jazz organists and pianists; he becomes Betschs mentor and, over the space of two years, John will play alternately with him and with the trumpeter Louis Smiths group. However, in 1965, John leaves town to go to the prestigious Berkeley University in Boston and do a two-year course along with his fellow debutants with names like John Abercrombie, Ernie Watts and Alan Broadbent. Two years later, he is invited by a pianist friend, Billy Chilf, to join the legendary singer/songwriter Tim Hardins group. Just after Woodstock, John Betsch and Tim record a psychedelic album Columbia will never release together with the members of the future group Oregon: Colin Walcott, Glen Moore, Paul McCandles and his friend Billy Chilf. But he soon leaves this group to return to Nashville where he hooks up again with his friend Bob Holmes. Two years later, he is accepted on Archie Shepp and Max Roachs famous course at the University of Massachusetts Amherst (UMASS) and for the next four years he participates in this collective of intellectuals and musicians under the aegis of the two masters. During this period he returns to Nashville to form his Society whose music is obviously influenced by the Afrocentric ideas of the UMASS student and political movement. However, the album, recorded in one day and in one take, also bears the hallmark of their generations psychedelic experiences, and in the themes and playing of the musicians we can hear a less violent form of music than the radical free jazz of New York or Chicago. Nature and environmental themes are the inspiration behind tracks touched by the spirit of Coltrane but also of Flower Power. After Amherst, John Betsch joins Marion Browns group in 1976, leaves Tennessee for good and makes his home in New York over the next ten years or so. He plays and records with Dollar Brand, Kalaparusha Maurice McIntyre and many others, before heading off to France. He has lived in Paris for the last twenty years and played in Steve Lacy, Mal Waldron and Archie Shepp bands, as well as forming groups of his own. He now lives in Paris and plays with many musicians/bands.